Quick overview Whether you're a student nurse on clinical placement or a healthcare worker on a busy ward, you need practical guidance at your fingertips, fast! This pocket-sized guide will help you to provide safe, effective, everyday patient care. Whether you're a student nurse on clinical placement or a healthcare worker on a busy ward, you need practical guidance at your fingertips, fast! This pocket-sized guide will help you to provide safe, effective, everyday patient care. 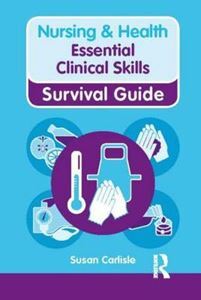 The Nursing & Health Survival Guides have evolved - take a look at our our app for iPhone and iPad. The new edition of this popular book combines the theory and practice of academic writing for nursing and midwifery students. Developing understanding of the basics of academic writing and cognitive processes such as reflection and critical thinking, this text is an invaluable resource for learners at all levels.